Above: A portrait taken on my last day before I left for Australia. Above Right: Family at St Klida’s Luna Park, Melbourne. 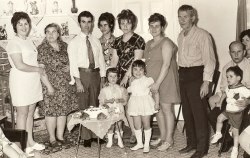 L-R: my parents, Ioannis and Maria, myself, my sisters, Taxiarhoula, Fotini and Efstratia, and Panagiotis (Finfinis). 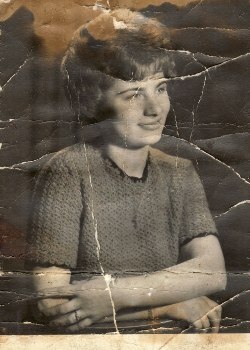 Efstratia and Panagiotis were engaged at the time. Above: At my engagement party. 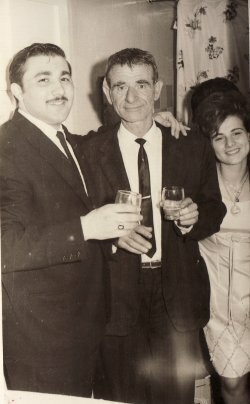 L-R: my fiancé, Ioannis Pirpiris, my father, Ioannis, and myself. Above Right : At my engagement party. 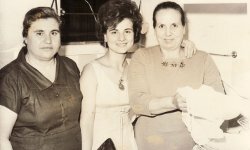 L-R: my mother, Maria Vaxevanis (nee: Apostola), myself and my future mother-in-law, Marianthi Pirpiri. 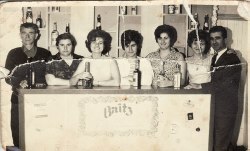 Above: L-R: my sister, Fotini Americanou (nee: Vaxevani), my mother, Maria Vaxevani, my brother-in-law, Panagiotis Fifinis, my sister, Taxiarhoula Vavoudis (nee: Vaxevani), my sister, Stratoula Finfini (nee: Vaxevani), myself), my father, Ioannis Vaxevanis. The two young girls in the front are: my niece, Stella Finfini and my daughter, Froso Pirpiri. Above Right: A family portrait. 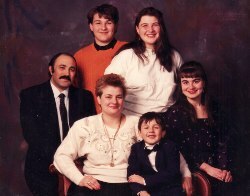 With my husband, Ioannis, and our children, Antonios, Pette, Froso and Mihail. Above: At our family business, Dino’s Coffee Lounge. L-R: my husband, Ioannis, myself and Ioannis Tsangaris.